Tally 2 is now available on the App Store. 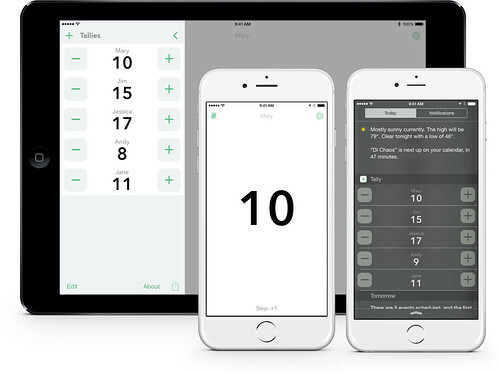 Tally 2 is free to use with up to two simultaneous tallies. One-time $1.99 (USD) unlock is available to enabled unlimited tallies and dark theme. Easy, eyes-free gesture-based counting. With an active Tally, tap to count up, swipe down to count down. Multiple tallies. Swipe right to manage list and create new tallies. The free version support two tallies, unlocked version unlimited. Today widget to increment tallies from anywhere, without even unlocking your phone. Configure tallies to count up or down. Set step and initial values to reset to a starting point, and count by 2s, 5s, or any arbitrary increment. Visual and audio confirmation of counts. Great URL scheme support for integration into iOS automation workflows. ï£¿Watch support planned for April, 2015! Review and ratings are always appreciated! Feedback and issues to info@agiletortoise.com. To keep up with tips and news, follow @tallyapp on Twitter and Facebook. We always appreciate you taking the time to review or rate Tally on the App Store! Get Tally 2 on the App Store.